Did You Know Apple Hid Huge Reference Books in Your Mac? 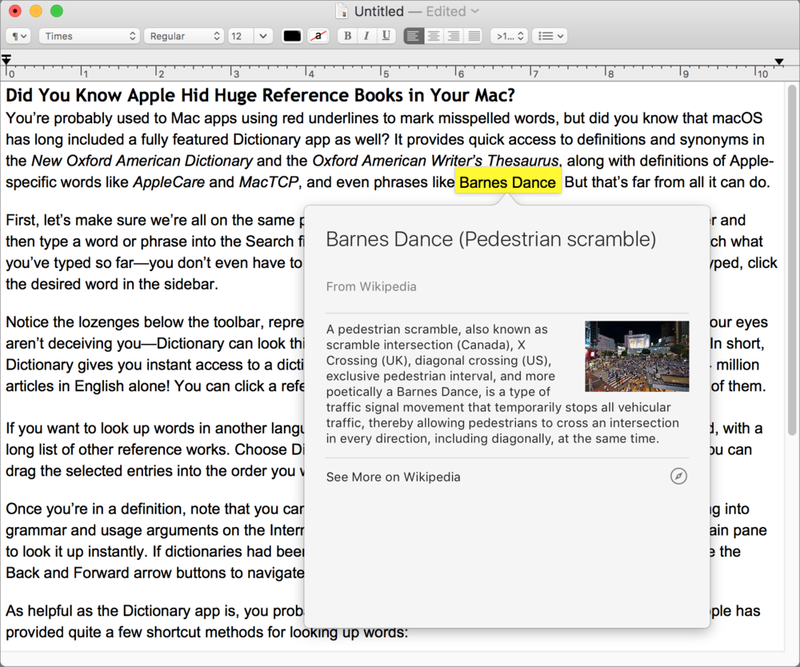 You’re probably used to Mac apps using red underlines to mark misspelled words, but did you know that macOS has long included a fully featured Dictionary app as well? It provides quick access to definitions and synonyms in the New Oxford American Dictionary and the Oxford American Writer’s Thesaurus, along with definitions of Apple-specific words like AppleCare and MacTCP. But that’s far from all it can do. First, let’s make sure we’re all on the same page. Launch the Dictionary app from your Applications folder and then type a word or phrase into the Search field. As you type, Dictionary starts looking up words that match what you’ve typed so far—you don’t even have to press Return. If more than one word matches what you’ve typed, click the desired word in the sidebar. Notice the lozenges below the toolbar, representing the references that Dictionary can consult, and no, your eyes aren’t deceiving you—Dictionary can look things up in Wikipedia if your Mac has an Internet connection. In short, Dictionary gives you instant access to a dictionary, a thesaurus, and an encyclopedia containing over 5.4 million articles in English alone! You can click a reference’s lozenge to limit your search, or select All to scan all of them. f you want to look up words in another language, or even just British English, Dictionary has you covered, with a long list of other reference works. Choose Dictionary > Preferences and select those you’d like to use. You can drag the selected entries into the order you want their lozenges to appear below the toolbar. Once you’re in a definition, note that you can copy text for use in other apps—always helpful when wading into grammar and usage arguments on the Internet. More generally, you can click any word in Dictionary’s main pane to look it up instantly. If dictionaries had been this much fun in school, we’d have larger vocabularies! Use the Back and Forward arrow buttons to navigate among your recently looked-up words. Press Command-Space to invoke Spotlight, and enter your search term. Select a word, and then choose AppName > Services > Look Up in Dictionary to launch Dictionary and search for that word. This trick should work in most apps, but won’t work in all. If the Look Up in Dictionary command doesn’t appear, make sure it’s enabled in System Preferences > Keyboard > Shortcuts > Services, in the Searching category. Last but best, hover over a word or phrase with the mouse pointer and either press Command-Control-D or Control-click the word and choose Look Up “word.” If the app supports it, macOS displays a popover with the definition or Wikipedia article. If you have a trackpad, you can also do a force-click or three-finger tap on the selected word—make sure the “Look up & data detectors” checkbox is selected in System Preferences > Trackpad > Point & Click. Now that you know how to take full advantage of the reference works that Apple has built into macOS, it’s time to get in touch with your inner logophile (feel free to look that one up). It’s the time of year when fireworks fill the sky above celebrations of all sorts. As the crowds ooh and aah at glittering chrysanthemum and willow effects, you may be wishing you could capture some of those moments with your iPhone. With these tips, you won’t need a fancy DSLR camera! 1: Pick a Good Location Consider your position before it gets dark. If you’re too close, you might not be able to capture the full glory of a massive burst. Too far away, and the fireworks will be little spots of light. Make sure there aren’t any power lines or lamp posts between you and the fireworks. If there’s nearby water, you might be able to take some interesting reflection shots. 2: Turn Off the Flash The iPhone’s flash works only at short distances, so turn it off to avoid annoying people around you. In the Camera app, tap the lightning bolt and then Off. 3: Disable HDR or Enable Keep Normal Photo You probably want to disable HDR by tapping HDR on the Camera screen and then tapping Off. HDR, or High Dynamic Range, combines three exposures into one photo, which works well when some parts of a scene are dark and others are light. The problem with HDR is that fireworks will move slightly between the exposures, which may introduce blur. That could be an interesting effect in its own right, so if you want to try leaving HDR on, be sure to enable Keep Normal Photo in Settings > Photos & Camera. That way, you can see whether you prefer the normal image or the HDR version. 4: Hold Still or Use a Tripod or Monopod To reduce the chance of your fireworks photos coming out blurry, keep the iPhone as still as possible—try holding it with both hands and pressing your elbows into your sides. Alternatively, use a tripod, although a monopod or selfie stick can offer stability while letting you more easily move the iPhone around to frame different portions of the sky. Burst Mode: Press and hold the shutter button or one of the volume buttons to take ten shots per second. You’ll have to sort through the burst afterward to find the best pictures, but you’re almost certain to get good ones. Live Photos: Fireworks are all about motion: the slow climb, the pregnant pause, and then the explosion of light and sound. If you enable Live Photos by tapping its bullseye icon in the Camera app (it turns yellow), tapping the shutter button will take a mini-movie of the action. Slo-Mo Video: If you plan to share your photos on social media, why not share a video instead? A regular video works, but try Slo-Mo mode in the Camera app to slow down the frenetic pace of a grand finale. Hold still while recording! Time-Lapse Video: Or, go in the other direction, and record the entire show as a time-lapse video, which compresses everything into a much shorter video. Just flip to Time-Lapse in the Camera app. You need a tripod for a time-lapse video. 6: Use an App for Longer Exposures Apple’s built-in Camera app doesn’t let you increase the length of exposures, which can provide striking light trails of fireworks. Lots of independent apps do offer that capability, including LongExpo (free), Shutter (free), Slow Shutter Cam ($0.99), and Manual ($5.49). Regardless of which you try, play with different exposure times to get the effect you want. One last thing. As much fun as it can be to photograph fireworks, don’t let the iPhone get in the way of enjoying the show with family and friends! Don’t Get Burned by Bad Cables… Literally! When coiling your cables, avoid wrapping them tightly around something. A tight wrap can cause kinks that will degrade the wires inside. Don’t create sharp bends in the cable, especially near the connector. Sharp bends can eventually break the insulation and reveal the wires inside. When unplugging your device, pull from the plug instead of the cord. That avoids stress near the connector. Keep the Lightning connector’s pins clean and away from liquids; crud or a drop of water on the pins could cause a short circuit. USB-C cables are less susceptible to such problems because of their metal jackets, but still be careful. If a cable’s insulation ever breaks such that you can see the wires inside, wrap it with electrical tape right away, and replace it as soon as you can. Don’t freak out about cable safety—although there have been problems, hundreds of millions of people have never experienced any trouble at all. But it’s still worth buying quality cables and taking good care of them. Apple just released new versions of all its operating systems—iOS, macOS, watchOS, and tvOS—fixing bugs, plugging security holes, and, best of all, adding a few new features. Here are four things you can do once you’ve updated. (If you’re concerned that installing the updates may cause other problems, check with us first, but it’s best to stay current. 1: Sleep better after using your Mac late at night. macOS 10.12.4 Sierra has gained Night Shift, a feature from iOS that automatically shifts the colors of the screen to the warmer end of the spectrum after dark. Night Shift may help you sleep better by reducing the amount of blue light that tricks your body into thinking it’s earlier than it is. If you’re working with graphics at night, or if video looks odd, you can to turn off Night Shift manually. Do that either in the Displays preference pane or by scrolling down in Notification Center (click it in the upper-right corner of the screen) to see the Night Shift switch. 2: Find the AirPod that fell between the couch cushions. Apple’s wireless AirPods earbuds are cute, but they’re also easy to misplace. If you can’t find yours, iOS 10.3’s Find My iPhone app can help. Bring it up, tap the AirPods icon in the display, and then tap the Play Sound button to make them play a locator sound. If you’ve lost only one AirPod, you can mute the other so it’s easier to hear where the sound is coming from. Note that Find My AirPods works only when in range of a paired iOS device, so it may not help if you lose an AirPod while running. 3: Don’t be “that person with the Apple Watch” at the theater. You’re in a darkened theater, at a movie or a play, and when you move in your seat or cover your mouth to cough, your Apple Watch’s screen turns on, annoying the people around you. Even worse is when a notification rolls in, causing the watch to make a sound. Embarrassing, we know. Happily, watchOS 3.2 adds Theater Mode, which turns on Silent mode and keeps the screen dark by disabling its standard “raise to wake” behavior. To enable Theater mode, open Control Center by swiping up from the bottom of the screen. Then tap the Theater Mode button, which is emblazoned with theater masks. After the performance, you’ll need to disable Theater mode manually by tapping its button again. If you do need to check the time surreptitiously (who knew this performance would go so long! ), tap your Apple Watch’s screen, or press the Digital Crown or side button. Copyright © 2015 MegaByte Computer Center. All Rights Reserved.